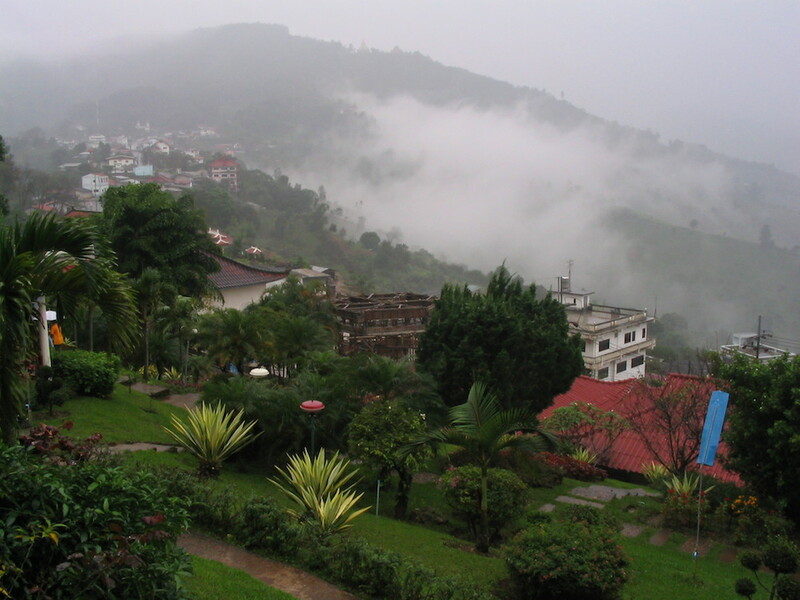 I’ll always remember my first visit to the semi-far-flung, northern Thai town of Doi Mae Salong. I’d just moved to Thailand with my business partner in late 1999 to develop a specialized travel company. We were in the kingdom’s northernmost province Chiang Rai looking for trip ideas and met a hippy-type who recommended renting scooters and driving 75km NW of the city, along what he described as “very exciting roads”. We rented 110cc Hondas, pocketed a map and hit the road. A secondary country road gradually climbed before reaching a windy unpaved track that cut its way along the spine of a mountain ridge, like a snake slithering across its top. Things quickly got steep and required maximum concentration, even for someone who’s driven a motorcycle since ten-years-of-age. Fourteen challenging and mind-blowingly-beautiful kilometers later we crested a ridge and terraced tea fields revealed themselves, blanketing every hillside. The effect was captivating with a cornucopia of greens; more shades than I previously believed existed, satiating the senses. After settling in to our room, some exploration revealed a rich social canvas. As recently as the early 1980s this town was prime opium country and a communist holdout. Thai authorities, with support from the US Drug Enforcement Agency, were keen to eradicate the drug and communists. In came today’s residents – Chinese immigrants, mostly Kuomintang from the southern Yunnan region. They’d fled Mao’s revolution, settled in Northern Myanmar, got kicked out of there, and in the late 1970s made their way to northern Thailand. 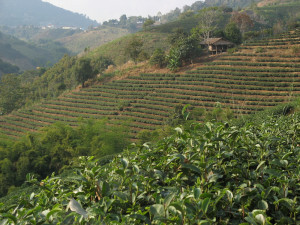 They didn’t have citizenship and knew how to grow Oolong tea, a black variety. The Thai government offered them citizenship and land deeds if they helped rout the communists and eradicate opium. Having recently fled a communist revolution in their homeland they had no problem fulfilling the first mandate and quickly replaced opium crops with tea. 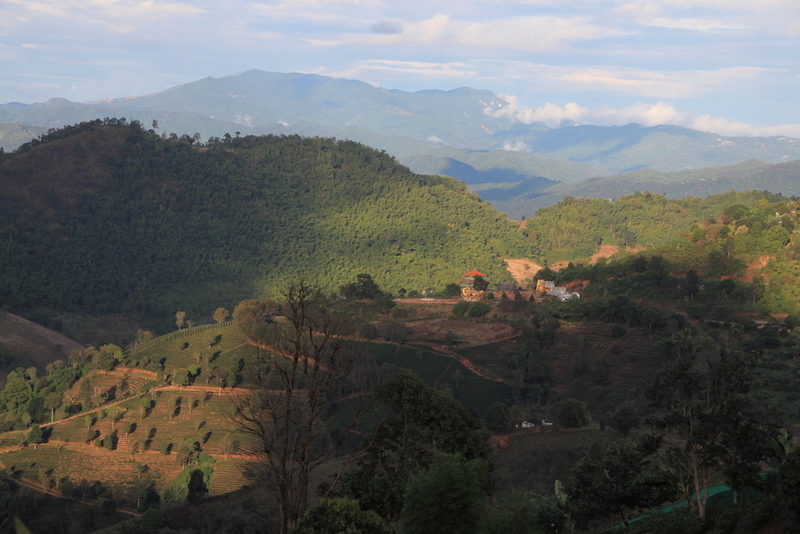 Problem solved, citizenship granted, and the path to modern-day Doi Mae Salong completed. The town also received another name during these semi-dark days, Santikiri, which translates to Peaceful Village. The Thai government at the time was all about using nice, colorful names to sooth tensions and make areas more desirable in peoples’ minds. 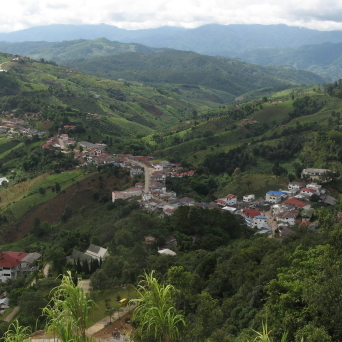 Santikiri is still used in concert with Doi Mae Salong to this day. Sprinkled throughout this captivating town of roughly 5,000 you have a few ethnically Thai families, some Thai Yai, a smattering of hilltribe groups, notably Ahka, who made their way here from as far away as Tibet more than 150 years ago. Like many parts of the world these ethnic minorities tend to do hard manual labor, of which there’s plenty required with tea production. You can see them hunched over tea plants on steep terraced hillsides, planting, picking, and farming, while the Thai-Chinese more or less run the town’s commerce and are now relatively wealthy. It was a recent first-time visit to Malaysia’s Cameron Highlands, famed for its tea production, and being extremely underwhelmed, which got me reflecting on the roughly 100 visits I enjoyed to Doi Mae Salong as the former owner of a specialized travel company. The town is rife with dirt footpaths, perfect for hiking, mountain biking, and dirt biking, pursuits I regularly indulged in. Few experiences in my travels have compared with making my way through Santikiri’s terraced tea fields, Ahka women in their shiny traditional headdress working the fields, while the town’s dramatic golden temple beckons from the tallest peak. And it’s all strung along and around one small road that weaves its way 2km along a mountain ridge and through town. Compact, friendly, colorful, dynamic – perfect for exploring. And then there’s the food – some of the tastiest I’ve had anywhere. Interesting Thai-Chinese blends, some with Burmese overtones (the border’s just 3km away), and even the odd hilltribe delicacy thrown in. You can’t walk more than a few hundred meters without encountering something new, exciting and well worth sinking your teeth into. Now living in Malaysia and it being one year since my last visit, I realize there’s a part of my heart that’s in Doi Mae Salong and will likely always reside there. I’ve spent more time enjoying its hills, people, and food, than I have almost anywhere else in the world. Spectacular views abound from every nook, cranny, and vantage point. Simply put, it’s one of the most enjoyable locales in the world, a place I yearn to get back to, and hope you can make it one day too. Kim and I were fortunate enough to travel with Scott on one of his 100+ visits (November 2001) and will never forget the journey, the scenery, the food, the people and most importantly the Leonid meteor showers (hundreds of ‘shooting stars’) that we watched for hours in the total darkness of a small village with no street lights … thanks Scott for the great memory!